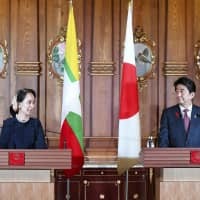 Visiting Myanmar leader Aung San Suu Kyi told reporters Tuesday that she appreciates Japan’s “straightforward” discussion on its concerns over Muslim refugees from the Southeast Asian country’s Rakhine state after meeting with Prime Minister Shinzo Abe in Tokyo. Thousands of Rohingya Muslims have become stateless refugees after fleeing from violent ethnic clashes and many were allegedly attacked by the Myanmar military. Suu Kyi, formerly a leader of a democratic movement in the country and now Myanmar’s de facto civilian leader, has faced criticism from Western media and human rights activists for her apparent inaction to stop reported atrocities committed against Rohingya Muslims. “I appreciate the stance of Japan and also welcome it,” Suu Kyi said through a Japanese interpreter during a joint news conference at the State Guest House in Tokyo’s Akasaka district. Suu Kyi also said an independent commission with two international members, launched in July, has been given “extensive and powerful authority” to investigate the issue. She said she expects that the commission “will conduct an effective probe” into human rights abuse allegations in Rakhine. Abe also said the refugee issue poses a “very complex and grave” problem, and Japan will extend assistance to help them return to Myanmar and resettle down there. 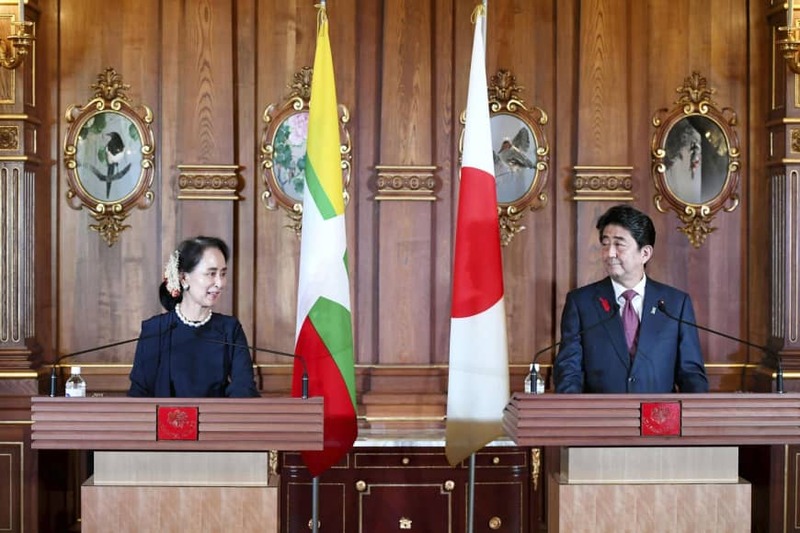 “The Japanese government, together with private-sector entities, will give its maximum assistance to help Myanmar build up a democratic country,” Abe added. The two leaders didn’t take any questions from reporters during the news conference. Their meeting was arranged on the sidelines the 10th Mekong-Japan Summit. Japan hosted Cambodian Prime Minister Hun Sen, Laotian Prime Minister Thongloun Sisoulith, Thai Prime Minister Prayuth Chan-ocha, Vietnamese Prime Minister Nguyen Xuan Phuc and Myanmar’s Suu Kyi for the summit.